The Sioux (pronounced "Sue") turned out to be one of the Milwaukee Road's most important secondary trains. First inaugurated just prior to the Great Depression the train ran the Iowa & Dakota Division originally between Chicago and Sioux Falls, South Dakota via Madison, Wisconsin. This routing took the train through southern Wisconsin, northern Iowa and southern South Dakota. After only a brief time in service it was extended much further west to the Milwaukee's furthest reach within the Midwest at Rapid City, South Dakota. Over the years the Sioux's consist changed but regularly carried fine accommodations such as parlors and sleepers. Diesels finally replaced steam during the 1950s and following a series of cutbacks it operated only into Wisconsin where it continued until Amtrak. The Milwaukee Road inaugurated a new train at Chicago's Union Station on June 20, 1926 known as the Sioux. 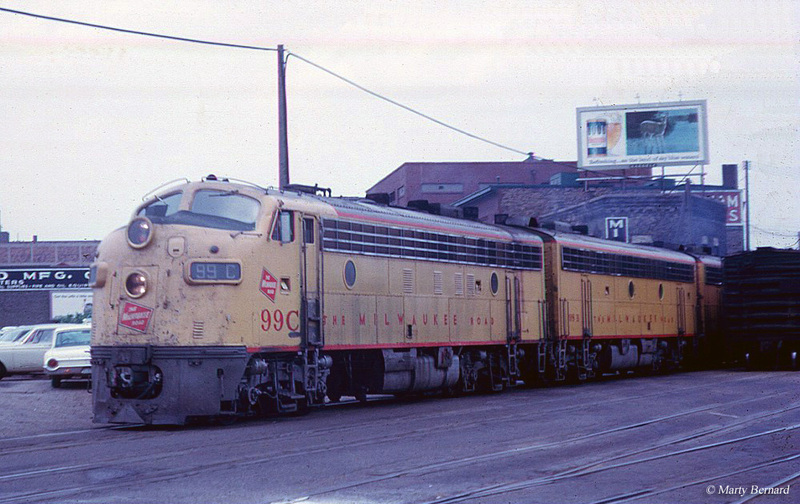 It was listed as trains #11 (westbound) and #22 (eastbound) on the railroad's timetable, running northwest out of the Windy City, serving Madison (Wisconsin), and then operating through northern Iowa before terminating at Sioux Falls, South Dakota. After only a year in service it was extended to Rapid City and according to Jim Scribbins' book, "Milwaukee Road Remembered," this move made the Sioux Milwaukee Road's longest end-to-end train outside of the transcontinental trains (then Olympian and Columbian, later Olympian Hiawatha) reaching the Puget Sound. Given the train's long operating territory it carried a considerable consist including three sleepers (reaching Mason City, the Twin Cities, and Sioux Falls), coaches, cafe-observations (which at first doubled as lounge and diner service), and usually a few head-end cars. Over the years the Sioux's consist changed considerably, predominantly concerning its through sleepers that connected to other cities outside of its operating territory. Despite the ongoing depression new services came to the train; during June of 1934 it acquired an air-conditioned, full-service diner and a standard observation between Chicago and Madison. 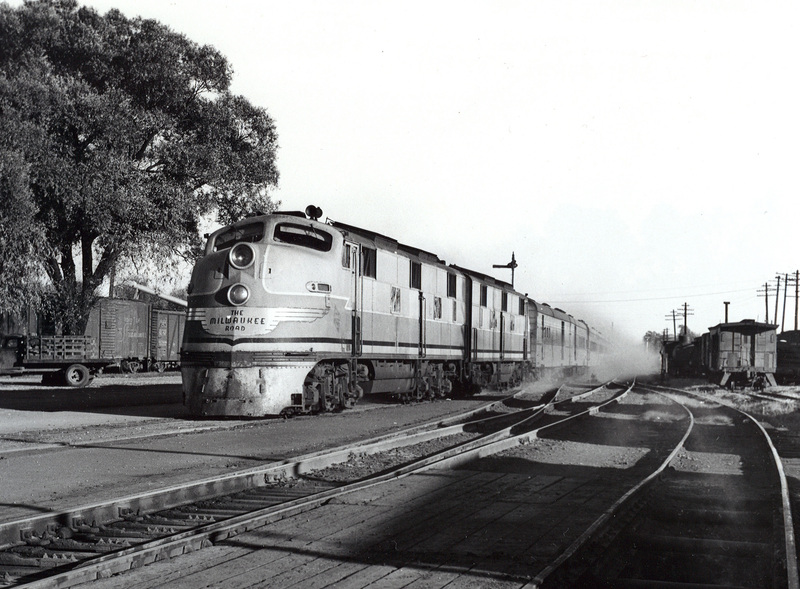 While streamliners were all the rage then, and the Milwaukee Road's heralded Hiawatha had entered service during May of 1935, one of the most notable accommodation improvements sweeping the industry at the time was air-conditioning. This new form of luxury quickly became a major marketing tactic, one in which the Milwaukee was well-aware. It worked quickly to implement the service into its most important secondary trains and the Sioux could boast fully air-conditioned status by the summer of 1937. Unlike most other corridors the Sioux never had to directly compete against one of the posh, speedy Hiawathas. The closest was the Midwest Hiawatha, which entered service during December of 1940 between Chicago and Omaha running along the Illinois and Iowa Divisions offering a section to Sioux Falls via Sioux City, Iowa. 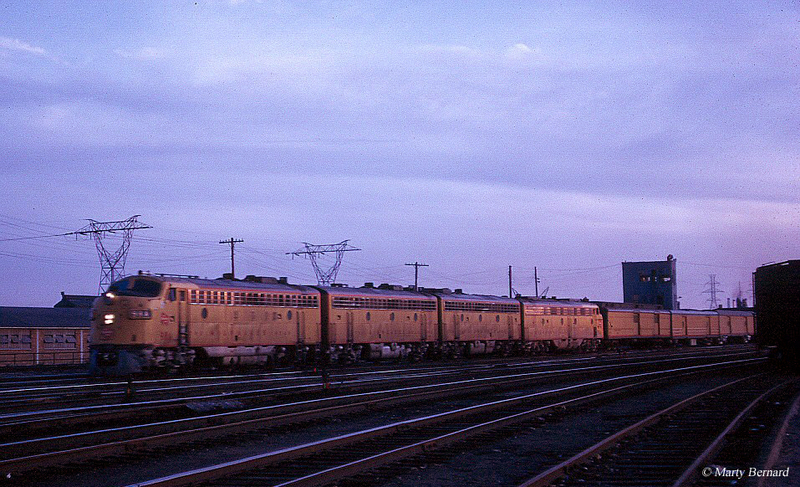 Interestingly, this new Hiawatha brought positive changes to the Sioux including the addition of some lightweight, streamlined coaches and a schedule improvement that offered a timed connection with the Midwest Hiawatha's Sioux Falls section. 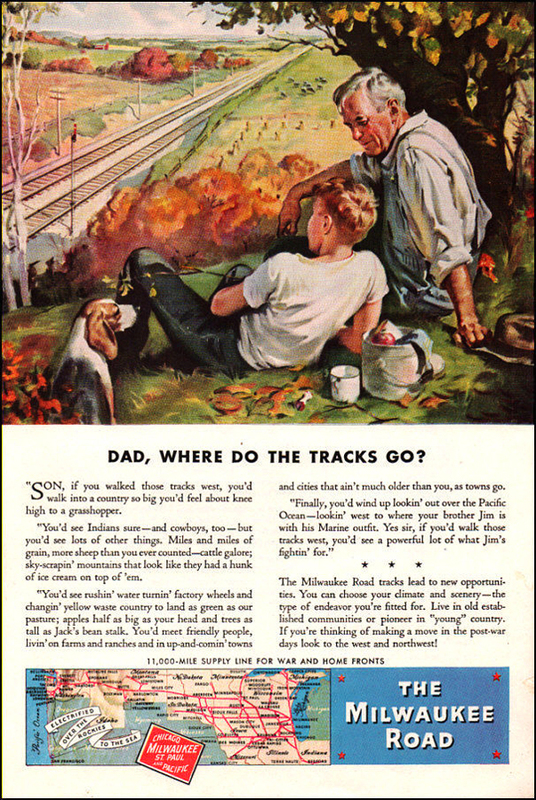 Through World War II the Sioux continued seeing various consist and schedule changes but the Milwaukee Road always seemed to regard it as important, never letting service or accommodations slip to a large degree. A few years after the war the train began exclusively carrying streamlined coaches, the closest it ever came to being fully streamlined (sleepers were always heavyweight). Depending on demand the train usually carried around a half-dozen cars. During the steam years Pacifics regularly powered the Sioux although during the late era Class F6 Hudsons could also be seen up front. 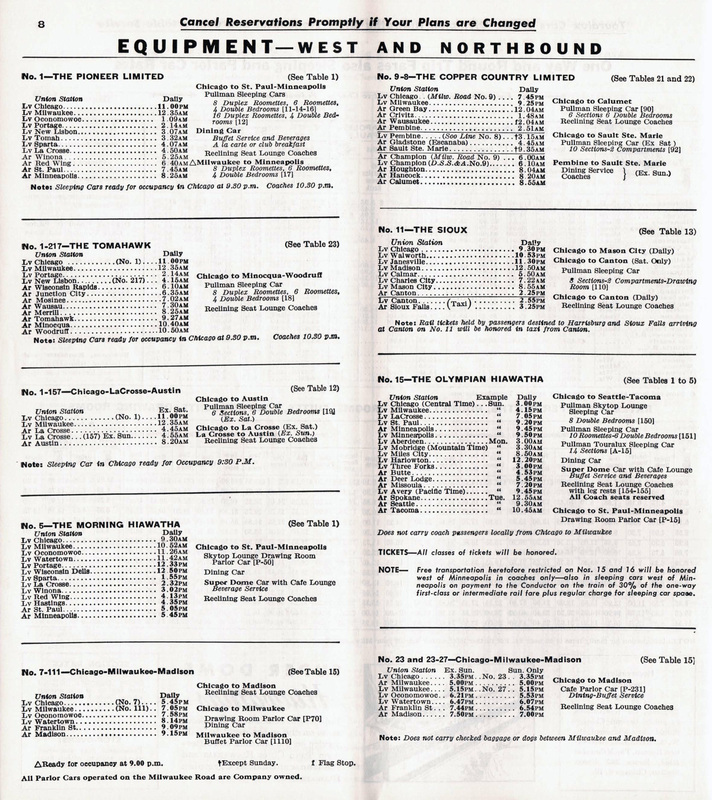 Somewhat surprising is that diesels arrived early on sections of the route; during 1947 new Alco RSC2s equipped with steam generators took over duties west of Mitchell, South Dakota and by the 1950s everything from Electro-Motive E7As to FP7s were powering the train the entire way. By then, retentions in service could be felt as the Milwaukee removed dining cars between Chicago-Mason City (Iowa) during 1951. Later that fall the train was cutback no further west than Canton, South Dakota (near the Iowa border) effectively ending intercity service through the state. A few years later the Milwaukee discontinued providing its own sleeper service and contracted to Pullman in providing the remaining car as far west as Mason City. During 1960 this became the fate of the Sioux itself, cutback between only Madison and Chicago, a schedule it would hold for the rest of its days. 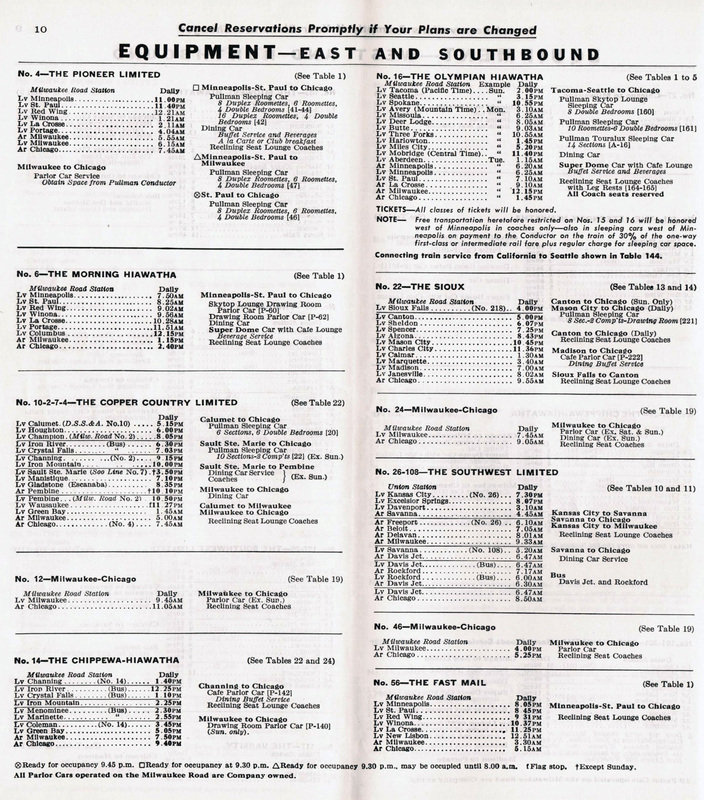 According to the Milwaukee's 1969 timetable the train, typical just before Amtrak, offered only reclining seat coaches that the railroad stated, "Dose not carry checked baggage or dogs." This meant the train ran with no more than one or two cars following the end of U.S. mail contracts in 1967. The Sioux departed for the final time on April 30, 1971 and was formally discontinued the next day.